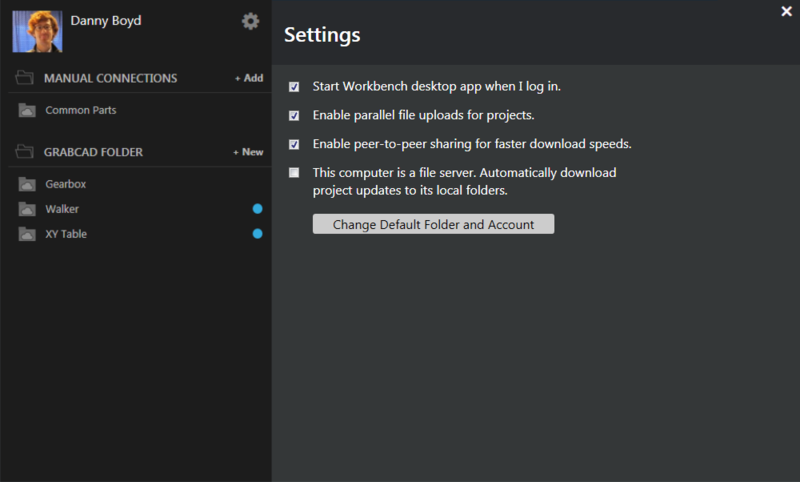 This guide will cover all the features of the Workbench Desktop App. 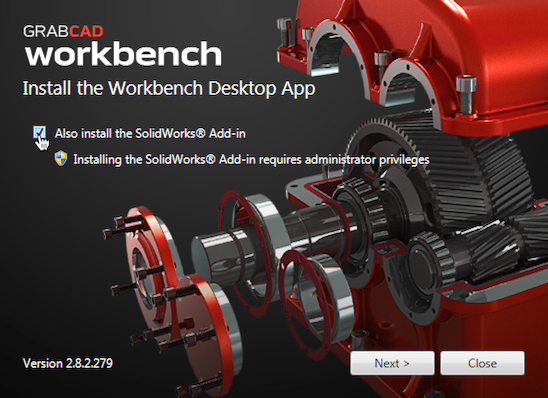 Get the latest version of the Desktop App here: http://grabcad.com/downloadworkbench The installer file will begin downloading immediately if you are on a Windows computer. Once the installer is downloaded, open the file and run the program. The first screen will offer the option of installing the SolidWorks add-in if you have SolidWorks 2012 or higher installed on your computer. Be sure to check this box if you are a SolidWorks user. After the installation completes, click Launch to complete setup. The Desktop App will open and you will have to log in with your GrabCAD credentials. If you had previously signed up for GrabCAD using 3rd party authentication such as Facebook or LinkedIn, click Can't Access Your Account to reset your password. First you have to choose a location for the default GrabCAD folder. This is the location where you will download all the projects you already have on Workbench, and where you can add new projects simply by creating folders. You can also move existing folders to this location to create projects. Make sure this location is on your local hard drive and not on a network shared drive or server. This folder will be added as a favorite in Windows explorer for easy access. You can change the location of this folder at any time from the settings menu. If you have access to more than one account, you must also choose the default account. Projects from the default account will be displayed in the projects list, however you can create connections to any project you have collaborator access to in other accounts from the gear menu. When you connect a Workbench project to a folder on your computer, you keep them in sync using the Desktop App. This way, you and your team always have the complete set of files, and they are always up to date. 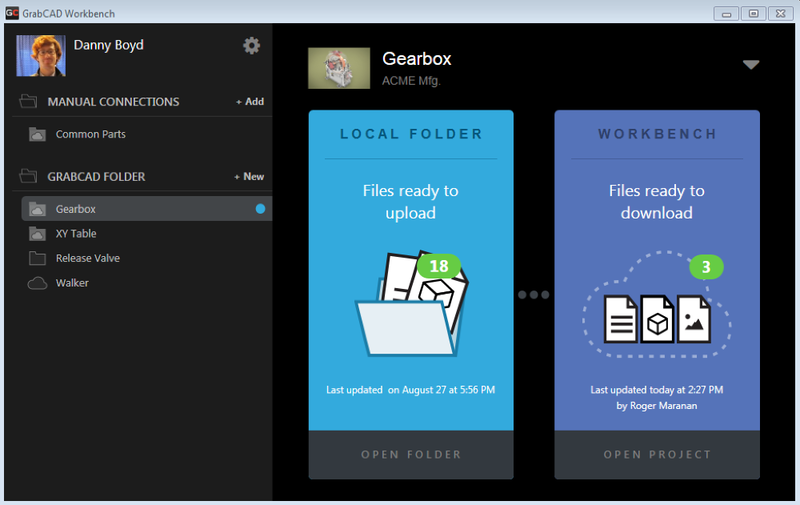 You can upload any new files or versions of files you create while working, and you can download those made by your teammates as soon as they are available. Because you can choose when to update the project, you don't have the problems typical of working from a network drive or shared folder, such as a teammate accidentally overwriting a work in progress. The projects list has two sections: GrabCAD folder and Manual Connections. Projects listed under the GrabCAD folder are linked or will be linked to folders inside the GrabCAD folder you created during setup. All projects you have collaborator or view-only access to on your default account will appear in this list. Projects from other accounts must be connected manually. Note: You can click on "GRABCAD FOLDER" for a quick shortcut to the GrabCAD Folder. Projects listed under Manual Connections are linked to folders in other locations on your computer. To create a manual connection use the gear menu and select Manually Connect Project. Connected project - GrabCAD project is in sync with a local folder. Disconnected GrabCAD project - GrabCAD project has not yet been given a local folder to sync with. Connect to the project in the connection overview or set up a manual connection. Disconnected local project - Local folder has not yet been uploaded to GrabCAD as a project. Create a project in the connection overview, then invite your teammates by right-clicking the connection in the project list. When you select a project from the project list, you will see at a glance if you have changes waiting to be uploaded or downloaded. Click the one of the blue areas to upload and download changes. Click Open Folder to see the files in this project and open them. Click Open Project to go straight to the project on grabcad.com to review version history, make comments, or manage your team. When the upload panel is blue, click it to view the list of changes pending from your local folder. From here you can resolve file conflicts, select and deselect changes to upload, and add a description to the update. Click on the column headings to sort by file size, date modified, or file path. Click Upload Selected to begin pushing the selected changes to the Workbench project. Note: You may have conflicts to resolve when uploading or downloading files. For more information on resolving conflicts, see here. To connect a disconnected local or GrabCAD project, click the green Connect button from the connection overview. If you would like to make a manual connection from a disconnected GrabCAD project, click "Manually Connect Project" from the gear menu. To disconnect a connected project in your GrabCAD folder, simply delete the local folder. You may want to upload any pending changes before doing so. Since the project remains on GrabCAD, you can always reconnect to it and download the files again. To disconnect a manually connected project, click on the connection and select "Disconnect Project" from the dropdown menu in the upper right corner of the connection overview. The project will now appear under your GrabCAD folder as a disconnected GrabCAD project if it is in your default account. If you move a manually connected folder into the GrabCAD folder, the connection will appear under the GrabCAD Folder list. 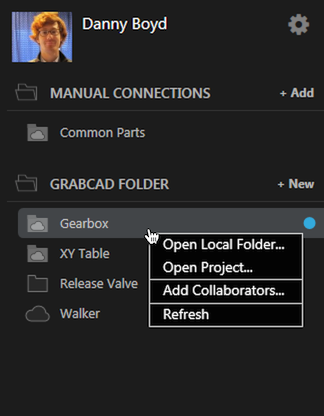 The best way to create a new project is to create or move a folder into the GrabCAD folder, but you can also create a new project by clicking "+ New" in the projects list, or by clicking "Manually Connect Project" from the gear menu and selecting Create New Project. 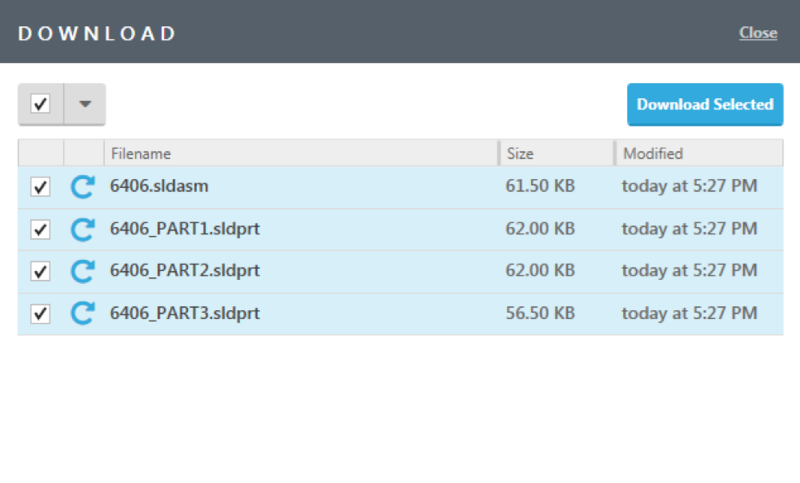 To delete a connected project in your GrabCAD folder, you must delete both the connected local folder and the GrabCAD project online. Go into the project and click the Settings menu in the top navigation bar. To delete a manually connected project, disconnect as described above, then delete the project online. Start up automatically - This starts the Workbench Desktop App when Windows starts and is recommended for daily use. Parallel uploads - This makes uploading faster but can take up a lot of your network's bandwidth. Disable this option if your connection is very slow. Peer-to-peer downloads - This allows users on the same Local Area Network (LAN) to download files from each other instead of from the Workbench Cloud for faster download speeds. Click here to learn how to set up peer-to-peer downloads. Server mode - This option is for when the Workbench Desktop App is installed on a file server. Click here to learn how to keep your server as a backup. Change your default account by clicking "Change Default Folder and Account" in the settings menu. Then connect to the desired project, and change back if necessary. Create a manual connection by clicking "Manually connect project" in the main menu. Create a new folder wherever you like, including inside the default GrabCAD folder.